The single image that the word “Bollywood” conjures in my mind is a dance scene at a wedding. Not just because they’re so ubiquitous in Hindi movies, but because the first scene from a Bollywood movie I ever saw — flipping through the channels and finding one on a local cable access channel — was a wedding dance scene. As such, Band Baaja Baaraat feels very Bollywood to me. The title literally translates as “Band Horns Revelry.” It’s not as poetic as the Hindi title, and it doesn’t signify a wedding to an American audience. (Our weddings don’t typically feature bands, horns or revelry, rather a disinterested DJ playing ’80s tunes while relatives shuffle awkwardly on a parquay floor in an embarrassing approximation of dancing.) The other translation of the title I’ve seen, “Wedding Music Band,” isn’t accurate either, as the movie deals with the whole wedding planning industry, not just the musical side. Shruti (Anushka Sharma) and Bittoo (Ranveer Singh) are recent college grads. After unsuccessfully hitting on Shruti, Bittoo begs her for a job at her new wedding planning company. His alternative is returning to his family farm for a lifetime of chopping sugarcane. Shruti gives Bittoo the brush off until he comes to her defense when a celebrity wedding planner insults her. Thus, a partnership is formed. The new company, Shaadi Mubarak (“Happy Wedding”), gets a reputation for honesty and fair prices and soon becomes the go-to company for small scale city weddings. Eventually, wealthy young clients take notice of Shaadi Mubarak’s kitschy style and hire the company for more lavish affairs. Everything is going well for new best friends Shruti and Bittoo, until they break the cardinal rule of financial partnerships: don’t mix business with pleasure. Feelings are hurt and the company falls apart. When things are going well for the pair, Band Baaja Baaraat is a lot of fun to watch. Shruti and Bitto are endearing characters, nice young people who enjoy what they do and deserve to succeed. There are plenty of excuses for fun dance numbers, as one of the duties of a wedding planner is to start the dancing at the reception (I wish we had a professional to perform this duty at American wedding receptions). The movie’s signature number, “Dum Dum,” is itself worth the price of admission. Sharma and Singh are talented dancers, and they are given plenty of opportunities to show their skill. The scale of the number is massive, with plenty of backup dancers and cool lighting effects. The song is catchy, too. The attractive stars are appropriately enthusiastic as a pair of young go-getters. Sharma’s expressive eyebrows deserve their own mention in the credits. Singh is confident and capable in his first starring role. Both seem are so comfortable playing their characters it makes Band Baaja Baaraat an easy film to get lost in. The movie’s biggest flaw may be that it’s almost too successful at showing the turmoil, once things fall apart. After spending the first hour learning to care about Shruti and Bittoo, it’s difficult to watch them fight, and it goes on too long. I kept wanting to yell at them to just make up and go back to having fun again. At its heart, that’s what Band Baaja Baaraat is: a fun movie about people whose business is making wedding dreams come true. It’s insightful enough to ring true, but always keeps sight of the fact that it’s primarily a movie to be enjoyed. This entry was posted in Reviews and tagged 2010, 3 Stars, Anushka Sharma, Band Baaja Baaraat, Band Horns Revelry, Bollywood, Dum Dum, Hindi, Indian, Movie Review, Ranveer Singh, Wedding Music Band on December 14, 2010 by Kathy. 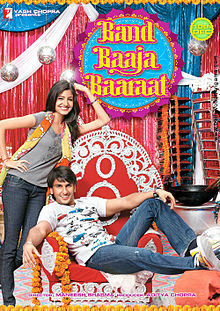 Bollywood Movies like BBB are always fun to watch and watching such a joyful movie is a mide relaxassion session itself! Especially movies made under Yash Raj Banner (Yash Chopra) are sooo lovable…though too optimisic and romantic! I loved this movie! Does anyone know where I can find the words to the last song in English? Does this site have what you’re looking for, Liz? Thank you so much! The words are hard to jibe with what I’m seeing on screen, so I’m glad to know for sure I’ve got the right song at least.